Home » Blog » Grow It, Cook It, Eat It for Castle Point and Rochford residents. Local mental health and wellbeing charity Trust Links is launching an exciting new course for people from the Castle Point and Rochford areas to learn gardening skills, cooking skills and to share a meal together. The ‘Grow It, Cook It, Eat It’ course runs for 12 weeks on Tuesdays – in the morning in Thundersley and in the afternoon in Rochford. If you are over 18 and interested in finding out more about growing your own vegetables and how to cook from scratch with fresh ingredients, this free course will be ideal for you. 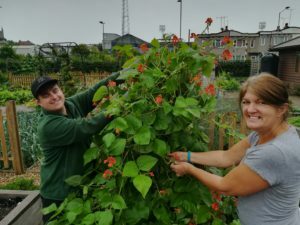 The Grow It Cook It Eat It course will be based at the award winning Growing Together community gardens in Thundersley between 10am and midday, and then at 34 Rocheway, Rochford between 2pm and 4pm. The course starts on 4th September, although you may be able to join later if there are places available. Courses are small in number, so if you are not used to group learning or have not done so in a while you can be assured you will be in a safe, supportive and welcoming environment. Pre-booking is essential. If you are interested in signing up for these courses, please call Trust Links on 01702 213134 or email admin-support@trustlinks.org.